The Regional round of Rotary's Young Chef competition took place at Orpington College on 16th March. Local girl, Florence Pattenden from St Nichlas' School in Church Crookham competed in this fourth round preceding the National Final which drew youngsters from across the south of England. Competition was intense for the 11 – 17 age bracket fighting for a place in the National final. Their challenge was to prepare and cook a healthy and nutritious 3-course meal for two for £20, the final presentation being part of the test. A team of three specialist catering judges was headed by Ms Tania Sumner, Faculty Head of Hospitality at the College. Despite the undoubted stress the youngsters performed very well. Florence Pattenden, the winner, aged 14, was a represenative of Fleet Rotary Club. Her winning dishes comprised a quail's egg starter, followed by a main course of pancetta wrapped cheese and mushroom stuffed chicken breasts with Hassleback potatoes, chantenay carrots and romanesque cauliflower, finished off with a dessert of pannacotta with pineapple and ginger salsa., chantenay carrots and romanesque cauliflower, finished off with a dessert of pannacotta with pineapple and ginger salsa. The Regional winner's awards of Certificate, engraved glass trophy, and cookery books were presented by Bromley's Mayor, Councillor Kim Botting. Florence will go forward to the National Final being held in Leeds on 27th April. She will be one of six Regional winners chosen from the original 5000 entrants across the UK. The winner of the National Final will be awarded a 3-day trip to Tuscany to visit the olive groves of the sponsors, Philipo Beriot. There will also be an invitation to a top London hotel to meet and learn from their Head Chef. 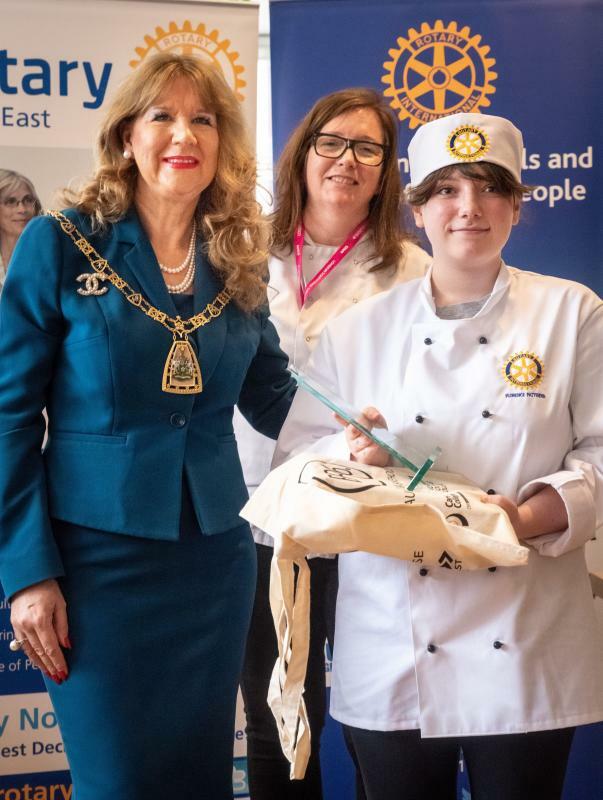 Commenting on the Young Chef competition Fleet Rotary's Youth Development Team Leader, Dr Richard Franklin, said the competition was one of several programmes testing skills in writing, music, photography, speaking and enterprise. Fleet Rotary Club wish Florence continuing success at the National Final.